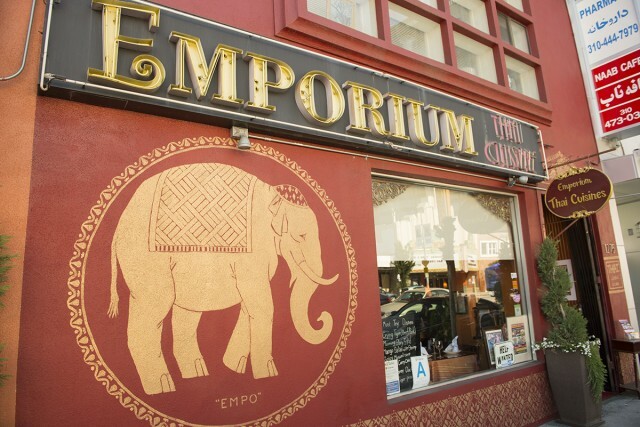 Westwood (Perfect Meal Today) 10/4/17/–I got the chance recently to try Thai Emporium and Westwood, and even thought the place has been around for 17 years, only recently have they decided to up their game with a new bar, a fledgling wine program and a trimmed down menu. 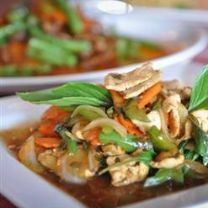 Run by the Sungkamee family, the atmosphere and lighting is perfect and they have perfected the Southern Thai style menu. 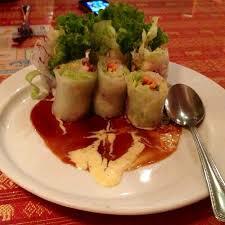 They are known for amongst other things their hotness and spicy scale of 1 to 10 where you can choose. I decided to go for the most popular which is #3 (medium) They have plenty of gluten free and vegan options as well as peanut free choices. The family all came to America in 1990 after winning a green card lottery, and John Sungkamee was the youngest of twelve siblings at the time. When they finally opened the restaurant, Supis his mother became a major part of the operation and her portrait holds a prominent place at the bar. His sister Gina Sungkamee is the chef at Emporium Thai, and her background includes four years at a high profile Bangkok Culinary Academy. This is a perfect place for the student crowd in Westwood who are fueled by the heavy social media and yelp presence that the restaurant relies heavily on to promote their business. Best way to start here would be with the Thai Chicken Dumplings (8.95) and then follow up with the Southern Buffalo Wings (12.95) with the special house spice. One of the famous Thai soups is the Tom Yum Soup (7.95) that was a real revelation for me with its sour taste and a strong hint of lemons. One of the best dishes was the Coco Mango Salad w/peanut sauce and shrimp with shredded raw mango, dried coconut, chilli and lime juice. We also tried the Southern Curry with Jasmine rice, a rare 30 year old family recipe that is unique to the restaurant. 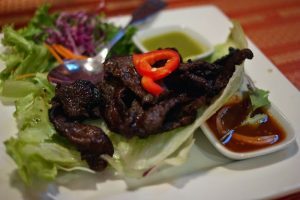 They have also recently launched the Thai Tapas Tasting Menu for $45 with wine pairings for $20 extra. First course is the Southern Wings with the 2016 Margerum Riviera Rose from Santa Barbara followed by the Papaya Salad that is creatively paired with 2016 Clos Henri Petite Sauvignon Blanc from New Zealand. 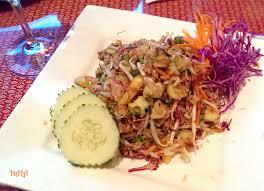 For this the Papaya are thinly sliced with spicy lime sauce and crushed peanuts. Third course is a Thai street dish called Pad Kra Pow Gai Sab, a mixture of basil and ground chicken stir fried with onions, chillies and garlic. You also get Panang curry with crispy pork belly and Jasmine rice. The feast concludes with Mango sticky rice with slices of mango.